Mobile devices in business can have its drawbacks. At the moment, I am juggling several presentations for clients, workshops, preparing material for webinars and of course writing this 30 day challenge. As mentioned before, I have never found one app that solves the issue. A lot of people when asking for my advice on apps, will often ask, ‘Just give me the app’? It’s not as easy as that and often I use several apps to replace a traditional process such as preparing a keynote or editing Microsoft Office © documents. Scenario: I have been sent a PDF (via email) which needs to be ‘marked up or annotated over’ with alterations and then I need to store that for future reference as well as being emailed back to several people. Step 1: There are many annotation tools such as iAnnotate, GoodReader and Notability for iOS. For Android, there are Adobe Reader (free), RepliGo Reader ($) and ezPDF Reader ($) (the link goes to the PDF guide on how to use the app). Step 2: In iOS, there are two options. The first if you are opening a PDF from a webpage you get two options. Open in > iBooks or Open in > ( AirDrop -you can share with someone else if they have iOS7) or any other app that will read PDF’s. The options I currently have include: QuickOffice Pro HD, Notability, Good Reader, Notes Plus, CloudOn, PDFpen, Showbie, DocuSign Ink, Explain Everything, Dropbox, Evernote, TeamViewer, Google Drive. These all have the ability to read PDF files (and some the ability to edit). 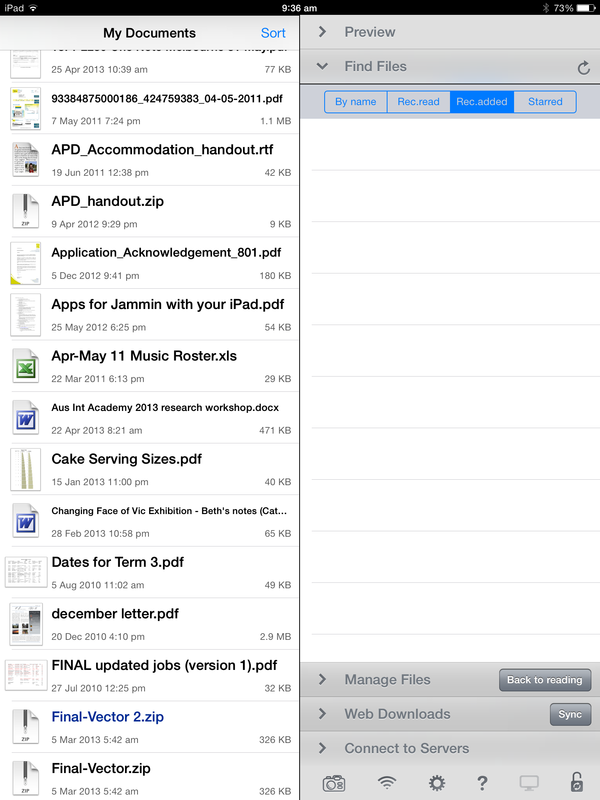 Step 3: Once you have the PDF open in one of these apps, then you can add text, drawings and highlight text. In GoodReader, you can ‘flatten copy’ which means the additional text/drawings will be embedded with the PDF or send the file ‘as is’. This file now can be emailed out or ‘Open In’. 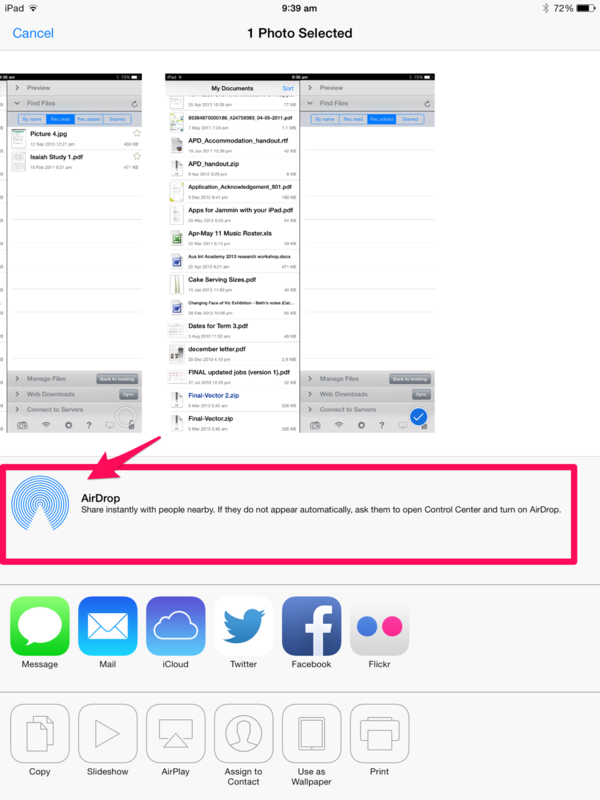 As long as these apps have the ‘Open In’ feature it makes the process much more streamlined. I could now send this to Dropbox or Evernote for filing in certain folders or notebooks. GoodReader and Notability would have to be my two favourites. I use them both of them in different ways when handling PDF files. 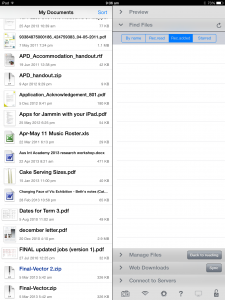 GoodReader is used when I have an email that comes in with a PDF attachment. It is sent off to Good Reader to be annotated (usually text highlighted or extra text added in. Digital Signatures versus Electronic Signatures (interesting document related to eHealth and clinical documents) will be discussed in another blog post. Usually, I use Notability when picking up a file from the Internet or accessing it from Dropbox or Google Drive. 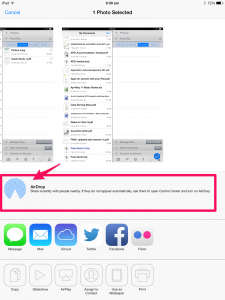 There is a little box (see image 1a below) for bringing new material into Notability and another box (see 1b) where the arrow is going out (sending the file back out to Email, Dropbox, Google Drive, Twitter, AirDrop, Open In> another app, Print or WebDav. For those who like handwriting notes, this is a great app. It also includes a hand rest section at the bottom and the ability to magnify the text/handwriting so you can fit more on a page. (Will talk about Penultimate and other handwriting apps tomorrow). What do you currently use on your mobile devices in business for handwriting? Everyone has their personal preference for styluses according to the touch of the tip and how well it glides across the tablet. Often I hear people complaining that the stylus (check here for the Stylus Company) doesn’t have a fine enough tip for them to write with but in fact for me personally, it’s the app that will determine your fine your drawing or handwriting is. Evernote has just released the ‘Adonit Jot Script Evernote Edition’ stylus that will start shipping at 4-6 weeks (love how thin the tip will be measuring at 1.9mm, just like a normal ‘pen tip’. Thanks for sharing feedback regarding this blog challenge. Great to see people discovering new ways of using their mobile devices. Keep sharing ideas with the ‘Tech Coach HQ’. Remember, to take ‘one byte at a time’. Refer back to Day 6 of this Blog Challenge for more great ideas.